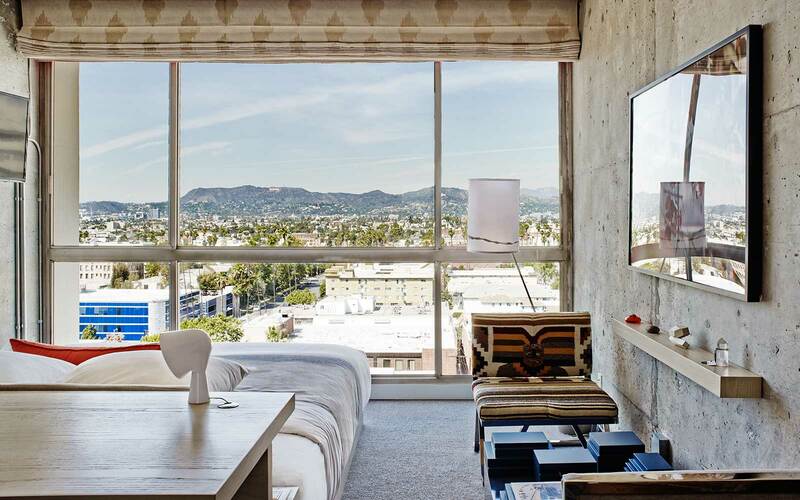 Designer Sean Knibb didn't shy away from agressive materials like concrete in the design of The Line Hotel in Los Angeles. To keep things from feeling too stark, the designer added softer elements like cloth lanterns and Mexican blanket chairs accent the otherwise simple interiors—easy additions to any bedroom that skews to tough. Suites at Copenhagen's Hotel Alexandra are inspired by renowned Danish designers of the 1950s and '60s like the iconic Verner Panton. This seating area shows how modern midcentury furniture can look when pieces are casually assembled. The graphic white and black walls and on-trend oriental rug help keep the scene from feeling too dated. Vienna's minimalist Hotel Daniel has no minibars or closets in any of its 115 guest rooms. While we won't be doing away with our storage anytime soon, it's a nice reminder that the bedroom should be a sanctuary. Maybe just put away the screens. In Center City Philadelphia, Morris Adjmi Architects designed ROOST, a hotel for long-term stays in a 1920s building complete with plenty of original details. While the structure itself is ornate, the rooms favor a subdued color palette of neturals and pastels that simply sends us dreaming.